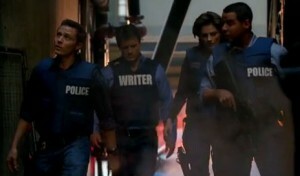 Part of the fanser­vice of the show con­cerns things that writ­ers and read­ers of books enjoy. In many ways, writ­ers, as celebri­ties, have fad­ed over the last 40 years as writ­ers of oth­er media (most notably movies) have out­shined them in our oh-so-celebri­ty cul­ture. 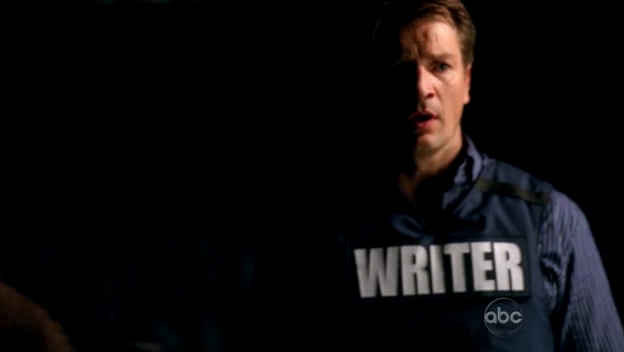 I have to admit giv­ing an admir­ing chuck­le when the show intro­duced the “WRITER” vest for Cas­tle. It fits per­fect­ly with his per­son­al­i­ty. Con­sid­er the pho­to to the left here. 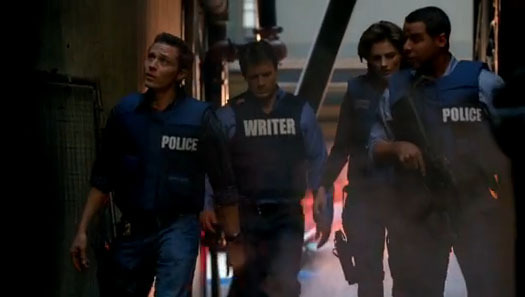 Notice that the “POLICE” vests have the word on the left pan­el tak­ing up rough­ly half the width of the vest. 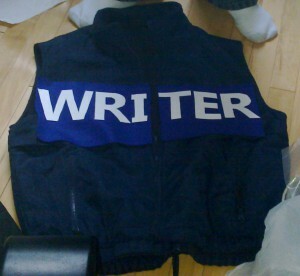 The “WRITER” vest has it’s word embla­zoned across the entire front. Who’s com­pen­sat­ing for some­thing? But that com­pen­sa­tion is per­fect­ly part of Castle’s char­ac­ter and pos­si­bly rep­re­sents how writ­ers and book lovers (in gen­er­al) feel about their craft. That either the book has too long tak­en a back seat to oth­er media (and thus requires the com­pen­sa­tion) or that the book, while impor­tant in their eyes, is less impor­tant to the world in gen­er­al and thus shares Castle’s need for com­pen­sa­tion. Seri­ous­ly, tho, it’s Hal­loween… and this is a cool cos­tume. 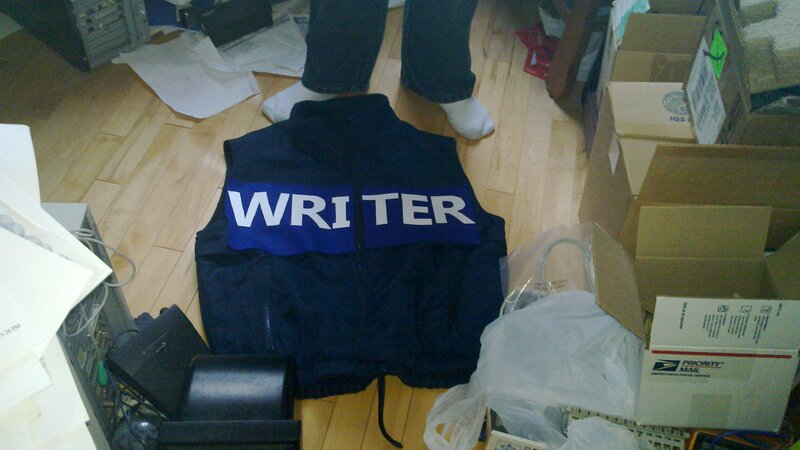 Chris­tine has tak­en a win­ter vest (gift from for­mer employ­er) and some dark blue felt (most­ly to cov­er the com­pa­ny logos). The let­ters are white poster­board — not the best choice, but they’ll do in a pinch. 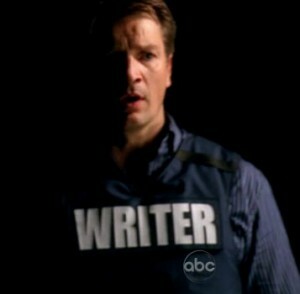 This entry was posted in Life and tagged bullet proof vest, castle, costume, halloween, police vest, richard castle, writer, writer bullet proof vest, writer vest. Bookmark the permalink. You know, you’ve got­ta pro­duce more copy if you want good ads on your page. I’ve got AdBlock­Plus dis­abled on your site, and no ads are appear­ing. Don’t you make a pen­ny or two when some­one clicks on your ads? Not very much. … but … hrm… they do seem to be bro­ken. Will have to look into it when I have time. Looks like google changed their ad stuff awhile ago and I didn’t notice it. I’ve tick­led their site to get new code and the ads should be flow­ing again soon :).